We wanted a lightweight pushchair to take on holiday with us next month and for those times when it is just a hassle using the big pram. 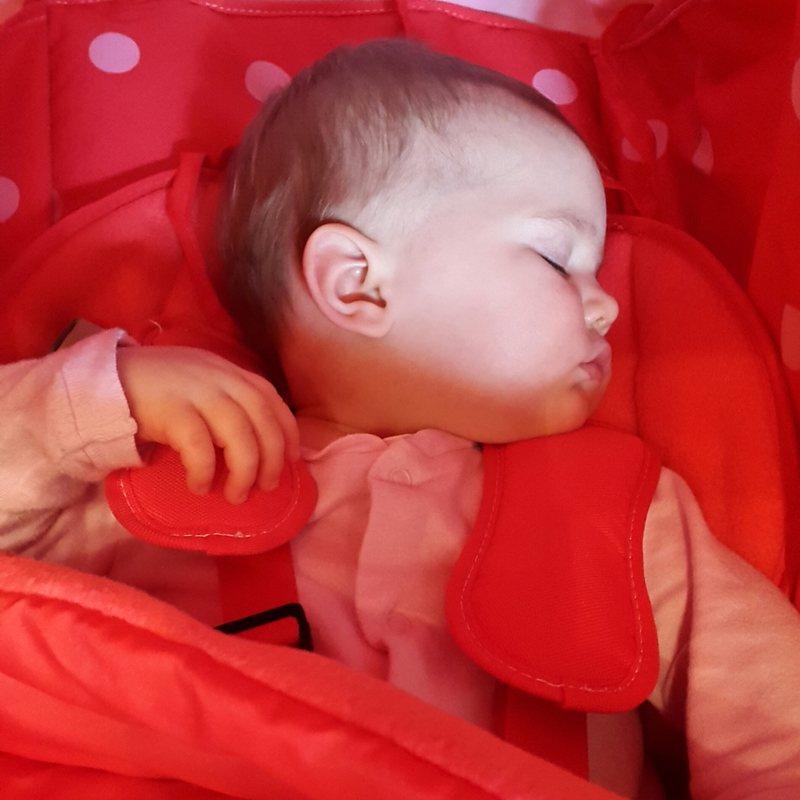 We had a bright green Zeta Vooom Stroller for Izzy and loved it – when it didn’t survive being stored in the cold, damp garage for the past year we decided to buy a new one for Clara. This time in bright red. Clara was being really clingy through the week and wouldn’t nap – which I now know is due to teething as two new teeth have cut through the gums in the past couple of days! I thought I would unwrap the pushchair and give it a try. Within minutes she was asleep! So now it is temporarily living in the kitchen and is my best friend at nap time. In fact, she is in there at the moment and I think she would be asleep by now if Izzy didn’t keep sticking her head in the pram. 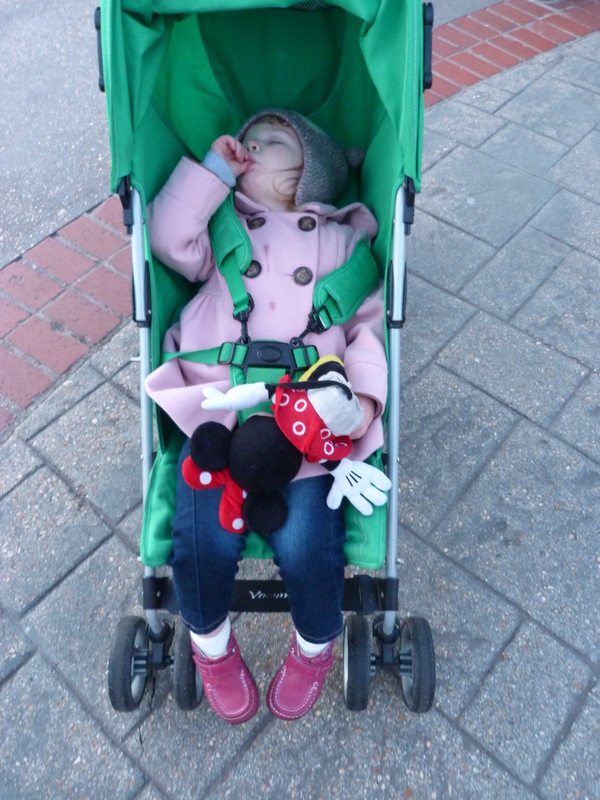 We mainly bought this pushchair a second time round due to the large hood and how far the seat reclines. We found these features very handy when we took Izzy’s green pushchair on holiday with us when she was 9 months old. She spent a lot of time asleep during the day due to the heat, and it was reassuring to know that she was comfortable and shaded from the sun. We then used it most days right up until just after she turned 3 when we took it to Disneyland with us. It was handy for the airport and when she got tired walking around the park. And having a brightly coloured pushchair was certainly useful when we had to leave it parked outside of rides in a sea of black strollers! This post is in no way sponsored – I just wanted to share a product we really like with you. It must be comfy the speed she falls asleep in it! It’s so easy to steer, which is handy with a 4 year old in tow as well. It comes in loads of colours too. I had to pick one my husband would be happy using – he said strictly no bright pink or purple! Thanks, it’s very bright – easy to find in a crowd! The sleep test is definitely a big one isn’t it! I’m impressed. It’s not a stroller I’ve come across before. Thank you for stopping by. It does amaze me how quickly she falls asleep in it! Thank you for another fab linky to join! We have given the pushchair a proper try out this week on holiday and there has been a lot of napping! Though that may have been due to the late nights and heat rather than how comfy the pram is.